Each one of my knives has a story. It starts with the source of antique high-quality American steel, and ends with an heirloom blade that looks as good as it feels to use. I’m an artist and craftsman working in the heart of Appalachia in Knoxville, Tennessee. Over the past 15 years, I’ve honed my skills creating custom works from wood, metal, and concrete. Drawing upon this experience, I now create hand-forged, heirloom-quality cutlery for the kitchen and camp from reclaimed steel. 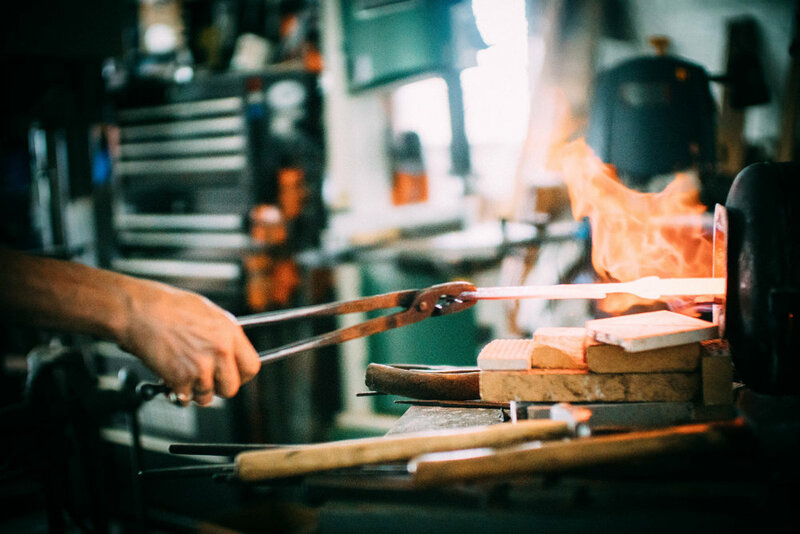 Over the past 5 years, I’ve grown Phillips Forged from a simple desire to create a better knife for my own use into a successful small business building and selling my handmade tools online and at artisan craft shows across the country. The blades start with selection of high-quality vintage steel I forage from this area’s antique sawmill blades, plows, and farrier’s tools. I then hand forge the blades using the same process, techniques, and tools blacksmiths used over a hundred years ago. I’ve studied ancient metalworking and incorporate those processes into my work, including Damascus steel and Mokume-gane (a Japanese metalworking procedure), as well as developing my own custom forge welding techniques. The knives then undergo a meticulous heat treatment process, where I harden and temper the steel. Finally, I construct the handles using the finest and most interesting materials I can find—from local woods to exotics, bone, and antler—and create unique inlays from prized stone and precious metals. An object used on a daily basis can either be mundane or a cherished belonging. I choose the latter. 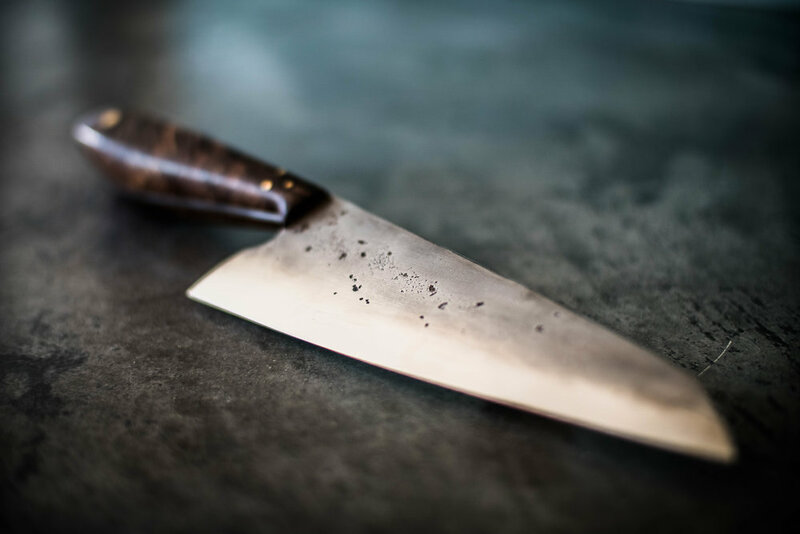 Each knife is a labor of love and takes up to 40 hours over several days to craft from selection of steel to finished piece. The steel’s origin and history, combined with the hand-forged process, ensure each piece becomes a unique, custom blade. 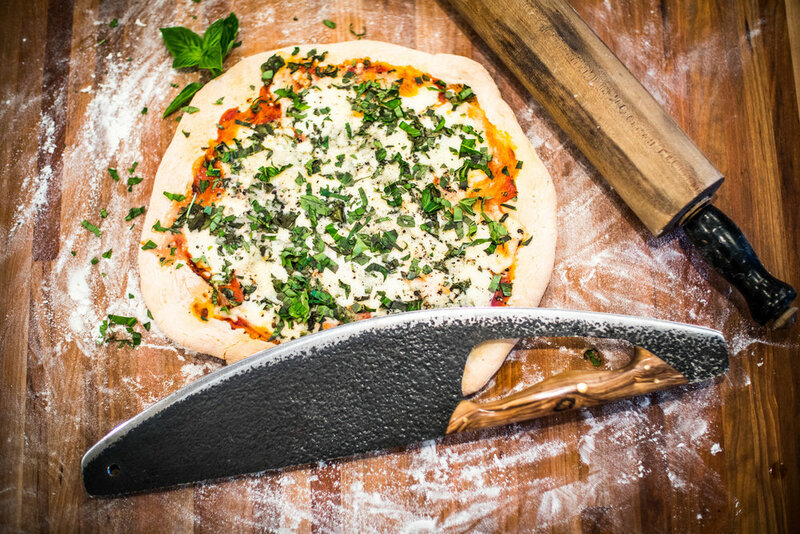 My connection to food is what ultimately brings me to knives. I believe in communal sharing around the table—good food, good friends, family, and well-made cutlery to present a memorable meal. I love to cook and share food with others and hope the tools I make can be used to share the love.